Easily create databases, inventories, collections and item lists. 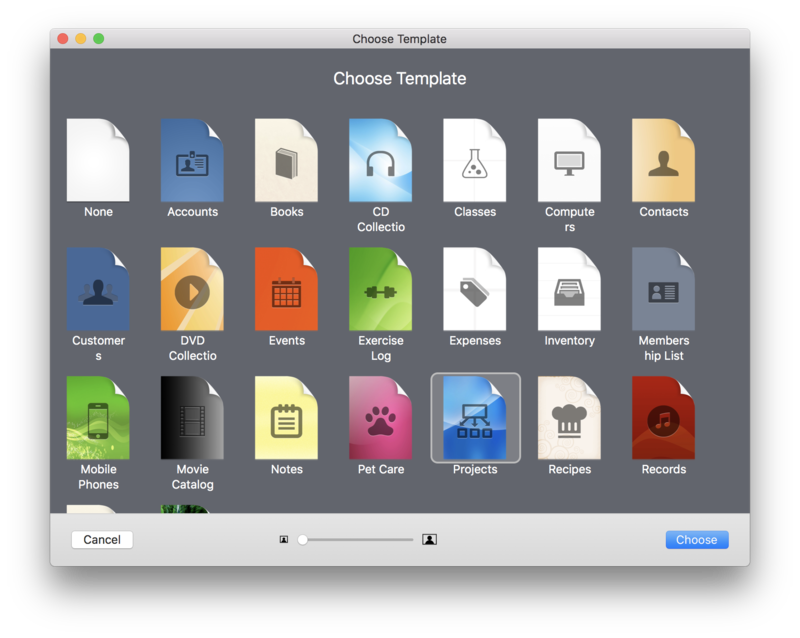 iDatabase is the Mac app that simplifies the creation of databases, inventories, collections and lists of items. iDatabase is the best there is for those who want to manage, store and quickly find any information for their passions and for everyday work. Create collections and inventories with a click. Without previous experience with databases, you can use the included templates to quickly create and customize databases containing inventories, membership lists, expenses, projects, recipes and more! You can choose from 22 ready-to-use templates and customize them to organize all types of information: Accounts, Books, CD Collection, Classes, Computers, Contacts, Customers, DVD Collection, Events, Exercise Log, Expenses, Inventory, Members List, Mobile Phones, Movie Catalog, Notes, Pet Care, Projects, Recipes, Records, To Do, Vehicle Maintenance. You can also create templates and share them with other iDatabase users. 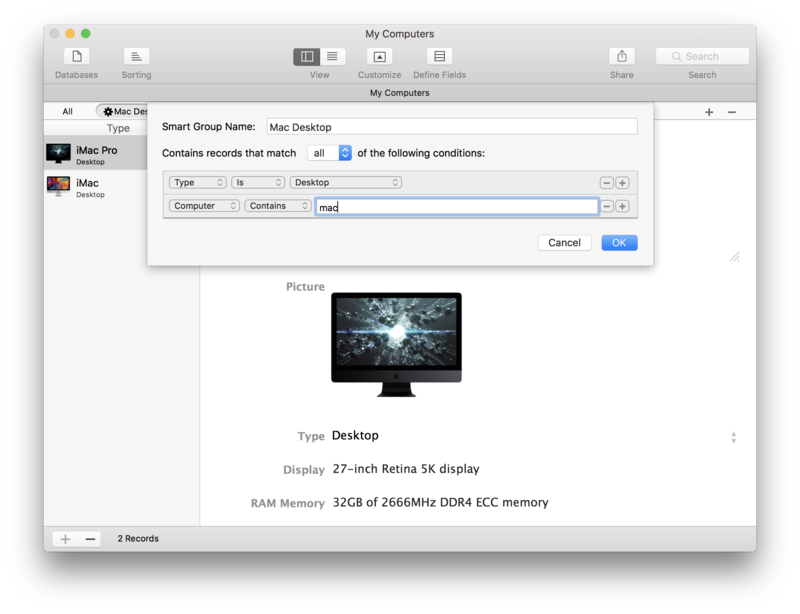 Creating databases on your Mac has never been easier. Creating databases on your Mac has never been easier thanks to the unique usage experience of iDatabase. You can use the included templates and then customize them, or you can create a database from scratch in a few minutes by adding your preferred fields. There are a large number of fields you can use to store text, images, links, passwords, phone numbers and arithmetic operations. You can create and customize in minutes a database to manage your collections, store the passwords of your accounts, create an address book containing contact information about your customers or anything else you need for your daily work. It’s so easily that it is amazing. Small Text Field use small text fields to store characters of letters, symbols, and numbers used as text in a single line of text without scrolling bar. Large Text Field use large text fields to store characters of letters, symbols, and numbers used as text in a multi line of text with scrolling bar. Number Field use number fields to store numbers. Date Field use date fields to store dates. Time Field use time fields to store time. Date and Time Field use Date and Time fields to store a date and time together to reference a fixed point in calendar time. Choose Field use item picker fields to present a list of mutually exclusive choices. Item picker fields are used as a means of selecting one choice from a list of two or many. Image fields use image fields to store images. Separator Field use separators to divide a record into distinct visual parts. Password Field use password fields to store passwords or any other sensible text data. Web Link Field use Web link fields to store web links, FTP addresses or any other URL. Email Field use Email fields to store email addresses. Checkbox field use checkboxes fields to indicate one option that must be either on or off. Calculation Field use calculation fields to present the result of a arithmetic operation between number fields content. A calculation field can be a result of addition, multiplication, ratio and subtraction. Let iDatabase filter the records for you. Are you looking for a specific contact, a book, your account details or a link stored in one of your databases? No problem, iDatabase will show you all the matches it finds. But with the groups function, everything becomes even easier: choose a group and iDatabase will show you the records that are part of it. And if you need to automatically select records matching certain criteria, you can use the Smart Groups feature that live filter records based on their properties. 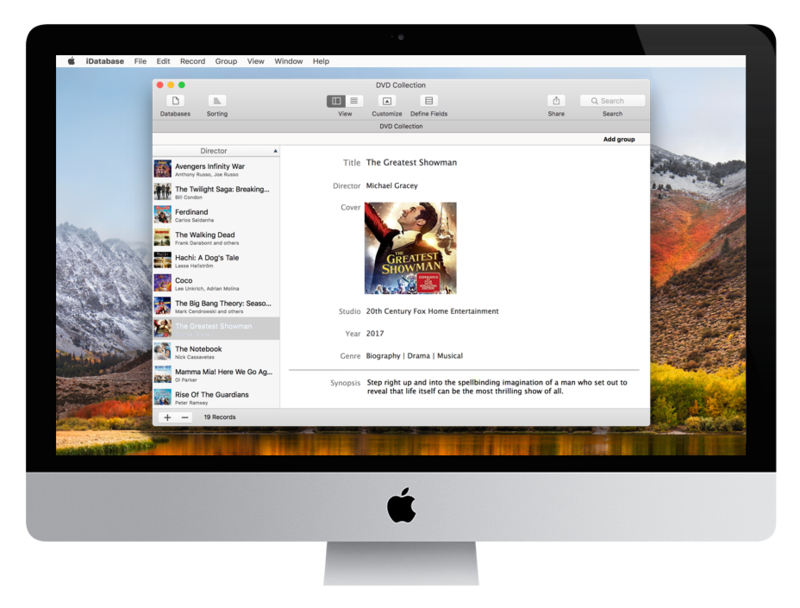 Sync via Wi-Fi between your Mac and your iOS devices. Data loss is a thing of the past with iDatabase and its built-in backup function. 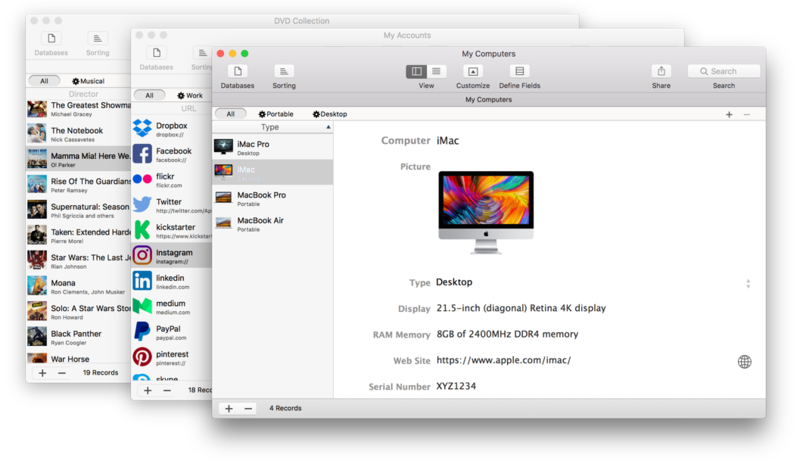 You can store and retrieve all your important databases locally on your Mac or remotely in your Dropbox space – just a click. 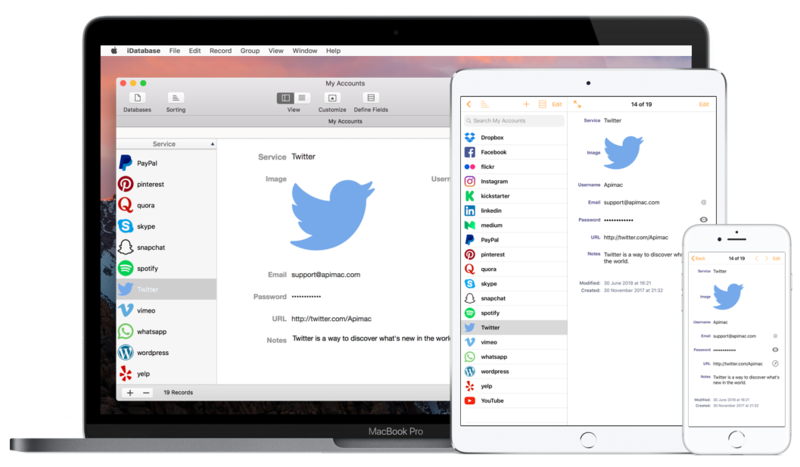 Have you ever dreamed of keeping the databases you have on your Mac synchronized with those you have on your iPhone or iPad? If you if also own iDatabase for iOS, you can do it with the Wi-Fi Sync function. Another great feature is the ability to share your work with friends and colleagues via email, in several formats. When you receive the file, you can import data immediately into the iDatabase for Mac, iPad or iPhone!